In addition to the regular bus service, Gran Alacant has its very own Tourist Train service to help you get around Gran Alacant! All our villas and apartments in Gran Alacant are within walking distance of a range of bars and restaurants, please see our Gran Alacant Restaurants page for a full list but the tourist train allows you the freedom to have a meal and a few drinks and explore different bars and restaurants without having to drive or walk back to your holiday villa in Gran Alacant! The 12 stops on the Gran Alacant Tourist Train route cover the main points of interest in Gran Alacant such as the beach, viewpoints, shops, restaurants etc. 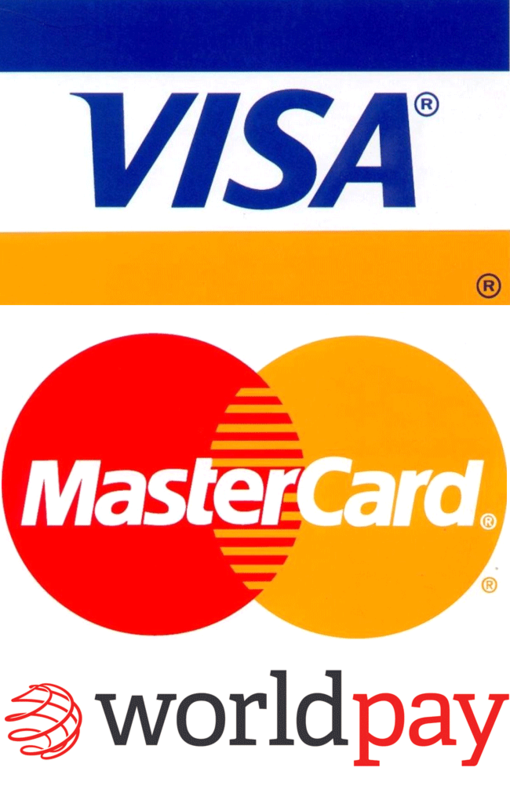 Train tickets are valid for one complete circuit, so once you have bought your ticket you can get off at any stop and then get back on again, at no cost, until the end of the circuit. This is also great news if you do not want to hire a car while on holiday in Gran Alacant, as the Tourist Train links up with all the main bar and restaurant areas, the beach and the supermarkets! Where Does The Gran Alacant Tourist Train Stop? The train starts at the municipal offices on Avenida Escandanavia (near Altomar 2) by Gran Vista, which was one of the first urbanisations in Gran Alacant. This is your nearest stop if you are renting an apartment in Gran Alacant on Altomar 2 or a villa in Gran Alacant on Altomar 1. From here the train travels down Avenida Escandanavia turning right into Avenida Mediterraneo by the Post Office. This is also your nearest stop if you are renting a villa or apartment in Gran Alacant on or near Calle Canarias, Victoria Playa, Camarcha Playa or Monte y Mar Upper. The train continues down the hill, with beautiful panoramic views of the Carabassi Beach and Alicante, towards the El Clot De Galvany Nature Park and, of course, the fantastic Carabassi beach! The beach is then a 3 minute walk and a further 3 minute walk along the beautiful boardwalk down onto the sand. This is your nearest stop if you are renting an apartment on Novamar 6 or 7, or Costa Hispania in Gran Alacant. From the beach, the train goes along to the Carabassi Complex in Lower Gran Alacant, where you can find a range of bars and restaurants. This is the stop for you if you are renting a villa in Gran Alacant in any of the Mediterraneo urbanisations, Novamar 4 or 5 or Avenida Polonia. The train continues over the roundabout, back towards the Commercial Centre and there is a stop here on Avenida Noruega. Here you will find Dial Prix supermarket and a range of restaurants and bars.This is your nearest stop if you are renting a villa with a private pool in Gran Alacant. The next stop on Gran Alacants Tourist Train is the Gran Alacant Commercial Centre. Here you will find Aldi, Consum, Lidl and Mercadona supermarkets, plus a range of other shopping outlets and banks. Upstairs in the Commercial Centre in Gran Alacant you will find a host of bars and restaurants. This is your nearest stop if you are renting a villa or apartment in Gran Alacant on Puerto Marino. From here, the train heads back up the hill to Upper Gran Alacant, via Avenida del Mediterraneo towards the Post office roundabout. This is your nearest stop if you are renting a villa in Gran Alacant on Calle Holanda. At the BBVA bank, the train turns right into Calle Monte De Santa Pola. This is your nearest stop if you are renting an apartment in Gran Alacant on Altomar 2, near the main pool and also the pharmacy. The train then continues along Calle Monte de Santa Pola, towards the Santara Resort, where there is a Maxcoop Supermarket and more bars and restaurants. This is your nearest stop if you are renting a villa or apartment in Gran Alacant on Don Pueblo or Monte Faro. At the far end of Calle Monte de Santa Pola, is the next stop for the Gran Alacants tourist train. This is also the nearest stop for the weekly Gran Alacant market. The next stop on Gran Alacants tourist train route is by the lighthouse at the top of Gran Alacant. This is your nearest stop if you are renting a villa or apartment in Gran Alacant on Brisas Del Faro or Olivio Del Oro. 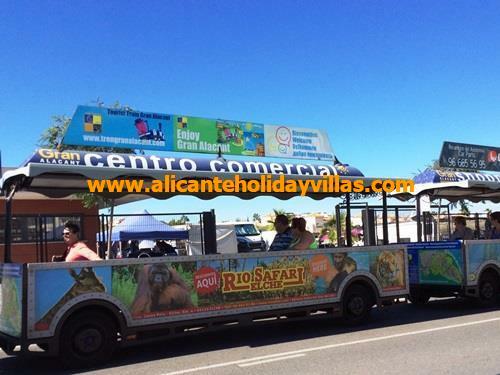 How Often Does The Tourist Train In Gran Alacant Run? The cost for 2017 is just 3.50 Euros PER ROUND TRIP for adults, children 2.50 Euros PER ROUND TRIP or 25.00 Euros for 10 days and children under 4 years travel free!.You can get off at any point along the route and get on at no cost until the end of the route.